On February 4th, Dr. Christensen covered some of the public data source options for samples used in large scale studies. But what is the state of public repositories used to annotate and interpret individual variations, both in translational research and clinical settings? In this webcast on February 19th, Gabe Rudy, Vice President of Product Development, will showcase publicly available databases and resources available for interpreting rare and novel mutations in the context of his own personal exome obtained through a limited 23andMe pilot in 2012. The last couple years have seen many changes in well-established resources such as OMIM and dbSNP, while motivating new efforts such as ClinVar and PhenoDB to bring NGS interpretation to clinical grade through a global data sharing effort. The changing landscape of public annotations: Then, Now, and Soon. Will the new human reference (GRCh38) released in December be a game changer? Specific examples of improvements in annotation and algorithms that result in more accurate analysis of his own exome. 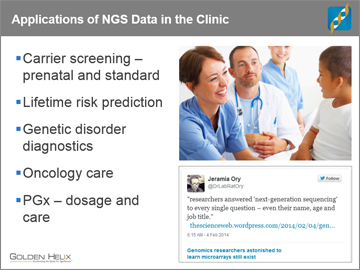 The utility and progress of NGS to different clinical applications in terms of public resources: carrier screening, hereditary cancer risk, pharmacogenomics, oncology care, and genetic disorder diagnosis. Sharing of new clinical data: How both variation and phenotype level data is currently being shared and what will be the way forward to match rare and undiagnosed cases at a global scale.